So you are set on your first doggy 5k race! Congrats and welcome to the world of races. Running can be addictive. You’ll be in better shape and have more energy than ever before! So…for starters a 5k is about 3.1 miles… a long distance for most dogs. It’s a good idea to research your dog’s breed to get a sense for how far your dog can run. Also, consult your vet to make sure your dog is ok to run. Your vet should also give you guidance on training, nutrition, and what to do if your dog is overheated. Puppies should not run until their skeletal systems have matured. Some senior dogs may have joint problems that limits how long they can run. Most dogs are natural sprinters rather than endurance racers, so we focus on a realistic 8 week run/walk plan that’s manageable for you and your dog. This plan covers training your dog to run at your side rather than in front (canicross). It will also let you learn your dog’s running abilities and needs slowly. We have added games every other week to help you teach your dog to run in a straight line and to develop a good pace with you. You should be going on consistent walks with your dog already and have good leash command. If your dog is aggressive or reactive on leash, it may be best to address those issues before signing up for a race where all dogs will be on leash and within close range. Your dog should know basic commands such as “leave it,” “stay/stop,” and “sit.” They should also have pretty good impulse control so they don’t go after squirrels and pull you around when you are running. Get your dog out of the house. Let’s go already! We will ask you to run a few times each week with your dog. It’s a good idea to stagger your runs so you are not running 2 days in a row. On your off days, you can rest, walk your dog, or go hiking with your dog where you have some hills as they help with strength training. You can also run on your own or do some cross training at the gym. You’ll need a 4-6 foot non-retractable leash and harness for your dog. Train in cooler temperatures during the day when humidity is low. 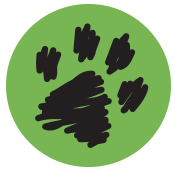 A nice trail or grassy area is the best terrain for your dog to run on to avoid paw injury and wear. Try using Musher’s Secret for all season paw care but apply before you go out. Don’t forget to bring lots of water and poop bags with you. Water breaks for you and your dog should be short and frequent. Above all, please pay attention to your dog. Most dogs will try to go as long as you go, even if they are exhausted. Stop and rest when you need it. Do a quick walking warmup and stretch before and after each run. Start each run with a bathroom break, drink of water, and a 5 minute warmup walk and stretch. Warmups and stretches help you and your dog avoid injuries. Read Running With Your Dog, for some more tips on what to do for your dog before and after a run. End each run with a 5 minute cool-down walk and stretch. Then, reward your dog by giving him some water, a treat, a fun massage, and some extra love for all his hard work! Don’t forget to check your dog for ticks and to make sure his paws are ok before heading home. If you are still feeling sore, stretch again and drink chocolate milk to help rebuild muscles. Walk: 30 min, 3x per week. Goal: Walking/Jogging in a straight line. This week we are going to work on getting your dog to walk in a straight line and to follow your lead. We want your dog to walk at your side and to not cross your path. With your dog at your side, start walking in a straight line. You can start out with a short leash with some slack. If your dog goes a block without pulling in front, praise and treat him. If he pulls in front of you stop. Call your dog back to you and have him look at you. To have your dog look at you, you can touch his nose with a treat in your hand, say “look” or and direct your hand to your face. Your dog will likely follow your hand with the treat. Once your dog looks at you and comes by your side, say “yes” and give him a treat or praise. Then, continue walking. Reward your dog with more slack on the leash when he does better over time. If your dog is extra active, ask your dog to sit at your side first, then look at you before treating him and going on. After awhile, you should not have to direct your dog so much. Say your commands and make your dog think what he needs to do. For the extra active dog, try additional focus / impulse control exercises with your dog and build them into your daily routine! Patience and consistency go a long way. Once your dog has mastery of walking straight at your side, try walking left, right, and around to make sure your dog is still at your side. If your dog pulls in front or crosses your path, stop and wait for him to correct his behavior. Challenge it up further by walking faster or jogging. Repeat this week if your dog is having trouble walking in a straight line. This is really important so you don’t trip over your dog while you are running! This game helps your dog get used to following your lead. It also helps to reiterate commands and make your dog think. Walk with your dog at your side on a short leash. Periodically ask your dog to go left, right, stay, sit, around, and look. Mix it up and reward with a treat every time he does something correct. If he does something wrong, stop and wait for your dog to look at you for guidance before continuing on. To make things more challenging just speed things up or mix in some tricks. Run/Walk: 12-14 minutes, 3x per week. Main Interval: 1 minute run / 1 minute walk (1:1). Week 2 is our first run-walk exercise! This week is not about you, but about getting your dog used to the pace of running vs walking. You also want to assess your dog’s abilities this week, but don’t forget the training from week 1! Our runs each week will now consist of 2 short weekday runs and 1 long weekend run. Start slow and take it easy. This may seem easy to you, but remember the point is to get your dog to get used to a pattern of running vs walking. This will help you pace your dog on future runs. Over time, your dog should learn to pace you but you also need to choose a pace that your dog can handle for 3.1 miles. Take the first few weeks to figure out what pace works best for you and your dog. For example, you could be walking at a 15-16 minute per mile pace and run at a 10-11 minute per mile pace. It helps to have a phone or watch with you that tracks your average pace running and walking. Remember, you can always start slow for your dog and then work on building stamina and endurance later. Do not let your dog go to the bathroom unless really has to go. You want to train your dog to hold it until you start walking and not go while you are running. Don’t forget to give your dog frequent water breaks rather than let him drink a lot at a time – the same goes to you! Try to figure out how much water breaks he needs. Check your dog often for excessive panting, heavy breathing, dry nose, or slowing down. This is an indication that you may need to stop and give your dog a small water break and cool down. Continue where you left off when ready. If your dog continues to have trouble go back to a lower run/walk interval or stop for the day depending on his condition. It’s also a good idea to check your dog periodically for worn or injured paws. Licking, limping, or running differently is a good sign something is wrong. Check your dog’s tongue for swelling or discoloration. If your dog’s tongue does not look right, call your vet immediately. Run/Walk: 16-28 minutes, 3x per week. Main Interval: 2 min run / 2 min walk (2:2). Goal: Learn “Go” and “Walk” commands and pace. Last week we taught our dogs the difference between running and walking. This week we want to use our new commands before we run (“go”) and walk (“walk”). Alternatively you can use mushing commands, “hike” and “easy” or anything else you come up with. Remember to use commands consistently. These commands come in handy especially if you start to run on more difficult terrain, come to a turn where others may not be able to see you, or in areas where there are a lot of distractions. Continue to pay attention to your dog and give frequent water breaks. Allow bathroom breaks only when walking. Over time, you will want to have your dog learn to pace you walking or running. If your dog runs too far ahead, stop and make your dog return back to you and then start again. You may want to incorporate treats the first few times you do this. Keep a loose leash when you walk and run. From here on out it’s practicing the things learned in the past 3 weeks and improving week after week. Practice your new commands to run, walk, and stop/stay with your dog – “go,” “walk,” and “stop/stay.” You can also play with the entire family. Elect one person to say the command words. The person who messes up first gets booted out of the game. The winner of the game is the last one remaining. Run/Walk: 18-36 minutes, 3x per week. Main Interval: 2 min run / 1 min walk (2:1). Goal: Master prior skills learned. By now you should be running 1-3 miles depending on your pace. You should discover a pace by now that you and your dog feel comfortable racing with. Stick to that pace and modify slowly as needed. Run/Walk: 25-35 minutes, 3x per week. Main Interval: 3 min run / 2 min walk (3:2). Go out on a walk with your dog somewhere crowded, either a tourist location or busy park. You want to simulate being at a crowded race with a lot of other humans and dogs. Bring a lot of treats with you. Walk with your dog on the side that is farthest away from others sharing your space. Every time your dog pulls at a distraction or another dog, stop and ask your dog to sit and look at you. Give your dog a treat only after your dog does this. You can also try using a clicker as you treat. If your dog walks by the distraction without pulling, give him a treat as well. Your dog should be getting a lot of treats on this walk! End your walk with a light jog or game of tug, fetch, or disc. If your dog keeps pulling, you may need to create more distance between your dog and other distractions and work towards closing that distance. Run/Walk: 25-40 minutes, 3x per week. Main Interval: 3 min run / 1 min walk (3:1). Run/Walk: 35-48 minutes, 3x per week. Main Interval: 4 min run / 2 min walk (4:2). Continue the same game as Week 5, but perhaps in a more crowded location. Run/Walk: 35 minutes, 3x per week. Main Interval: 4 min run / 1 min walk (4:1). Allow at least 2 days of complete rest (do nothing!) before your race. You may have to switch up your runs during the week. How was your first 5k? Are you ready to try something new?